Back cover blurb: You've been held captive in one room, mentally and physically abused every day, since you were sixteen years old. Then, one night, you realize your captor has left the door to your cell unlocked. For the first time in eight years, you're free. This is about what happens next ... Lily knows that she must bring the man who nearly ruined her life - her good-looking high-school teacher - to justice. But she never imagined that reconnecting with her family would be just as difficult. Reclaiming her relationship with her twin sister, her mother, and her high school sweetheart who is in love with her sister may be Lily's greatest challenge. After all they've been through, can Lily and her family find their way back after this life-altering trauma? 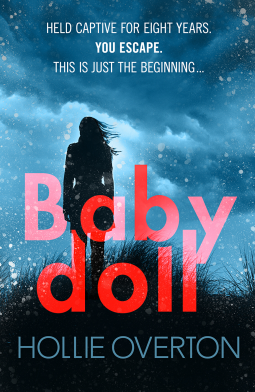 Impossible not to read in one sitting, Baby Doll is a taut psychological thriller that focuses on family entanglements and the evil that can hide behind a benign facade. Lily's twin sister Abby was always convinced that her sister was still alive and bound to return, yet her return is still a shock. Both girls were still teenagers when Lily was taken, so have grown into adulthood without each other. Lily has become a Mother to a 6 year old daughter, Sky a result of horrific abuse by her abductor, whilst Abby is just months away from giving birth to a child from a loving stable relationships. Their lives could not be more different. Yet the bond between twins is something that neither of them can ignore, and as they work to resolve their relationship and Lily and Sky try to integrate themselves back into 'normal' society, they realise that things are going to be okay. As Rick's trial looms ever nearer the fight for justice becomes stronger, but will he get the sentence he deserves? Baby Doll is slightly unusual in that the kidnapping and perpetrator are revealed early on in the novel, but that doesn't stop it being gripping in places. It is a novel with some disturbing themes, and can make for uncomfortable reading, but its ending is more than worth it. Baby Doll is available from 30 June 2016.